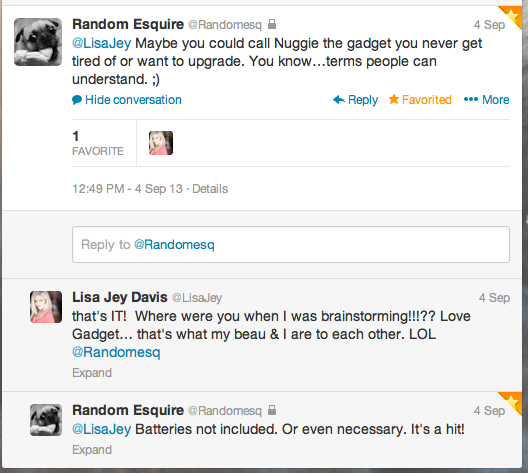 I recently reconnected with one of the first bloggers I ever fell in love with – Random Esquire. Random’s posts were well-written, witty and packed so full of ingenuity I was sick with jealousy. My kinda love. I’d thought often about Random, who’d left the blogosphere some time ago, and wasn’t sure how to reach out. Then I recently found a twitter handle that seemed to fit, and BINGO, it was my long lost pal. Since then, we’ve been tweeting back and forth reminiscing about the good ole’ days. You can call us THAT.